Before we start describing the cloud services that Eurotech offers, it’s probably best to define what the “cloud” actually is. Cloud is much more than just outsourced IT—it is a complete re-think of the way that businesses make use of IT. There is a book by Nicholas Carr, “The Big Switch,” which describes this transition by way of an analogy: In the late 1800’s many companies ran their own complex, expensive electricity generation units to power their production lines, but with the advent of the utility companies it was possible to buy cheaper power through the simplicity of a plug socket in the wall and a monthly consumption-based bill. Suddenly, having your own power plant was no longer a competitive advantage, but potentially a liability. In much the same way, the advent of the internet has made it possible for “compute” utilities to make IT infrastructure, software and services available from a central datacentre “in the cloud” and to distribute this power to end users over a simple network cable (or even wirelessly). Today, investing in a vast array of on-premise IT equipment may not be the best or most economically advantageous way for a business to deploy and utilise IT. 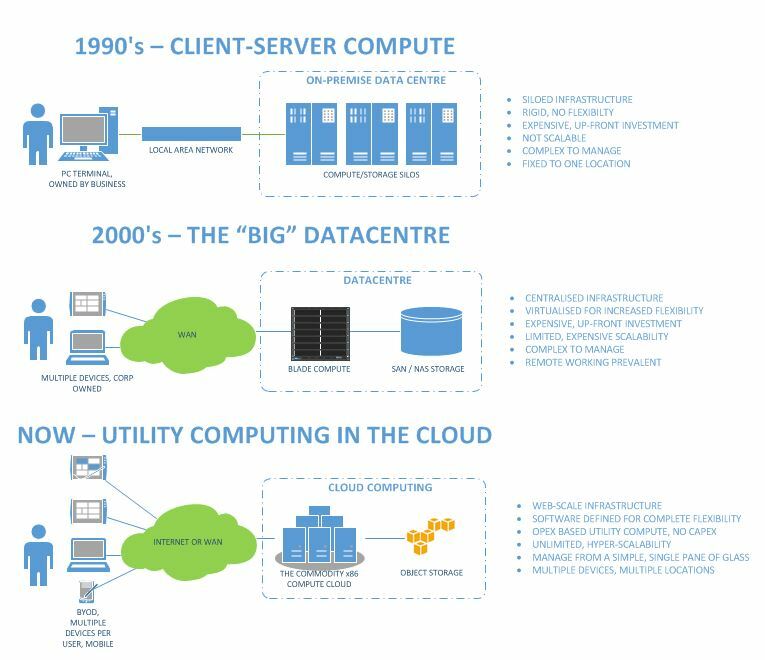 2010’s: Hyper-converged, software-defined datacentre architecture comes of age – matched with advances in virtualisation, this is the building block for true “cloud” infrastructure. Internet penetration via mobile becomes near ubiquitous. Cloud-based applications for the consumer market are widely adopted. Cloud computing becomes a reality for the enterprise and many new business go “all-in” with cloud IT infrastructure from day 1, with very little investment in on-premise IT. resources are now managed by specialist cloud infrastructure providers. Cloud compute and storage resources are accessed by customers when needed and paid for purely on an OPEX basis. Furthermore, in order to be truly “cloud”, these services must be software-defined, which means that changes to configurations of servers, networks and storage are all driven through a web-based control panel and don’t require the plugging in or moving of disks, cables, servers etc. Of course, that’s an over-simplification and cloud isn’t always the best (or only) solution to your business’ IT challenges. That’s where Eurotech Computer Services comes into the picture. Designed to solve business challenges. Developed to meet real world requirements. Is your requirement capable of being delivered as a service? Is the technology required to deliver it from the cloud not only available, but proven? Can we meet the expectations if delivered as a cloud-based service? Will the service be reliable and meet both your and our own high expectations? Does delivering the requirement as a cloud service expose your business to any undue risk? Can we deliver the cloud service at a TCO that is lower than an on-premise solution? And, finally, can we honestly deliver a cloud service that is better than an on-site solution? Eurotech has adhered to these principles in developing our cloud services portfolio and we’ve invested into developing services that are offered with an assurance that they will meet the expectations and all agreed requirements. Most importantly, our cloud services are price-competitive and we can help implement them in a way that avoids pricing surprises from one month to the next.